Born in Java in 1926 in what was then the Dutch East Indies, Rudolf Idzerda had a colourful and interesting life ahead of him, which would involve being a World War 2 pilot, rising through the ranks to become a Rear Admiral in the Netherlands Navy and later becoming a director of the newly-formed World Wildlife Fund (WWF). An enjoyable childhood was interrupted when war came to the region in the 1940s when the Japanese invaded. Rudi trained as a pilot and flew with 120 Squadron of the Netherlands Naval Air Service alongside the Royal Australian Air Force (RAAF), seeing action in the Dutch East Indies, Papua New Guinea and elsewhere. After the war he continued his career with the Dutch Navy, eventually rising to the Rank of Rear Admiral. His many experiences as a navy pilot included pioneering work with aircraft carriers flying aircraft such as the Sea Fury and Sea Hawk. He was also involved, as a helicopter pilot, in the rescue operation after the devastating North Sea Floods of 1953 which overwhelmed the Dutch sea defences and caused widespread devastation. On leaving the Navy in 1975 he was recruited as a director for the newly-formed World Wildlife Fund at the suggestion of HRH Prince Bernhard of the Netherlands. This led to a fascinating second career in which he toured the world promoting conservation issues. 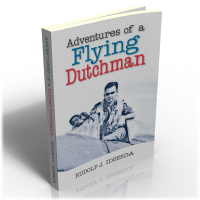 The many episodes of Rudi's fascinating life story are told with charm and much good humour and contain elements to entertain readers of all persuasions ~ from aeronautical buffs to animal lovers.